Nan Myers is one of my favorite curators of all that is scrumptious and good here in the South. Her store, Firefly in Thomasville, Georgia is worth a visit, especially over the holidays. Her gorgeous shop is chock full of unique and beautifully crafted gifts for men, women and all the kiddies. It's a bit of everything, which is why I'm so happy that she agreed to share some of her favorite holiday picks with all of us. Nan, "It's starting to look like a winter wonderland at Firefly. 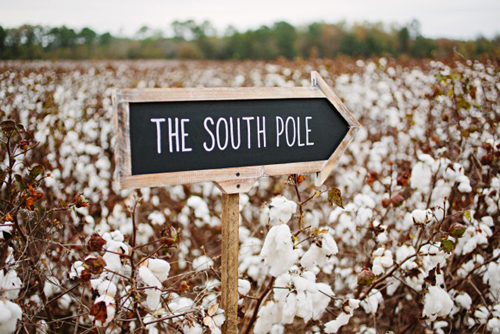 I have strung cotton from the fields with fishing line, draped Spanish moss on our Christmas trees as I try to create The South Pole in our cozy store." 1. SMOKE & PICKLES COOKBOOK, $29.95. Smoke & Pickles has been popular among the men folk in my store and I can see why. Chef Edward Lee has a food story that could only happen in America, but even more appealing to us Southerners because he landed in Kentucky at the famed restaurant 610 Magnolia. Born in Brooklyn, NY to Korean immigrants, his patchwork cuisine like collards kimchi has Korean roots with a lot of southern soul. Plus, he's a natural born storyteller which adds another layer of flavor to his debut cookbook. 2. PINECONE BAKING TINS, $10.95. I love the pinecone baking tins. These come with a suggested gingerbread recipe but I am dying to try a madeleine recipe that I have squirreled away in my recipe box. 3. STATE CUTTING BOARD, $52. This makes entertaining easy and will be a conversation starter too. We offer Georgia, Florida and Alabama. Made out of bamboo and in the USA. 4. GEORGIA OLIVE OIL, from $4.50. Good Extra Virgin Olive Oil makes me really happy and I hope Santa remembers to put one of these bad boys in my stocking! I was skeptical when I heard they were producing olives in Lakeland, Georgia but after a taste, it was clear as moonlight through the pines that they were onto something good. From the field to their own mill in less than 48 hours, their oil is collected from only the first pressing of the fruit. 5. BLUNDSTONE BOOTS, $120. What do you give a shopkeeper that has access to all of the above? Some kicking new boots for 2014 of course. I am loving these safety orange pair of Blundstones. 6. CEDAR SOAP, $8. A perfect stocking stuffer for the men. I love the packaging of course, but the soap has a really nice, complex cedar scent as well. 7. LOCAL RATTLESNAKE CUFFS, $48. I am not a fan of poisonous snakes, but I will certainly wear a dead one. These rattlesnake cuffs slither out of our front door and get compliments wherever they go. 8. BLACK-EYED PEAS EARRINGS, $38. These sterling silver earrings promise to bring good luck all year round! These little South Georgia cuties are made locally by my creative friend Tracy who has the neatest little studio tucked in the woods.